The L Ladybug was introduced in 1990 and is currently still available. 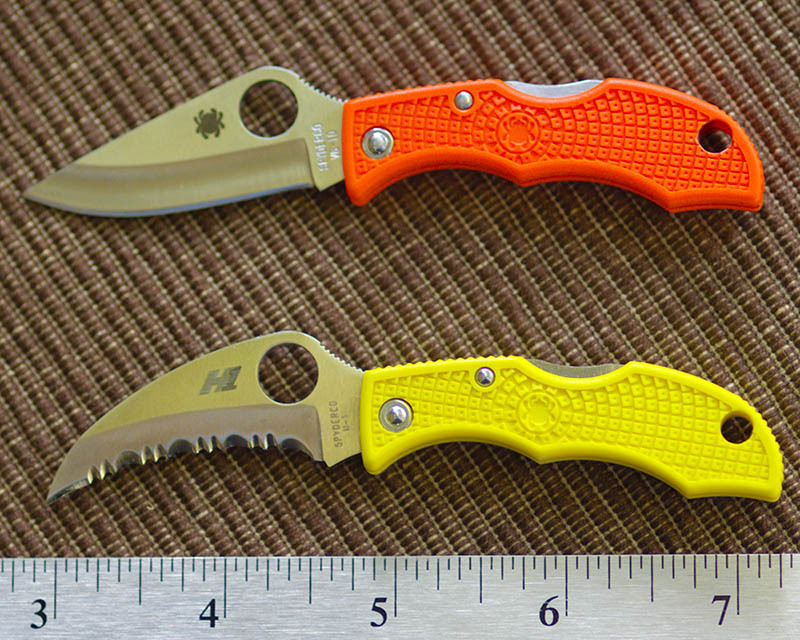 The Ladybug is Spydercos smallest FRN lightweight knife and can for example be attached to a keychain. 4 History, mentionings from the forums etc. Three L Ladybug generations can be differentiated. They are described in the following. The first Ladybug variations introduced in 1990 all have a modified clip-point blade (the Ladybug was first listed in the 1990 Spyderco price list, and the 2003 Spyderco dealer catalog mentions 1990 as the year the Ladybug was introduced). Throughout the years many different handle colors were available. Blade steels used for first generation Ladybugs (L1) are GIN-1/G-2, AUS-8, AUS-6, and ATS-55. In the "regular" offering of Spyderco only blades with PS edges were available till 2003. From 2004 till 2006 PE and SE were available instead. Intentionally targeting the Japanese market only, additional color variations and blades with plain edges before 2003 were produced. Part of these variations made it back to US and European shops (at least Golden Edge Cutlery and Ironstone in the US and Klötzli in Europe... more shops, details???). Combination of differently colored Ladybugs with a black Micro-Light (Photon). Listed in the Ironstone catalog. The second generation Ladybug (L2) is a combination of the L1 handle (black FRN variation only) with a Sheepfoot Blade and serrated edge. an enlarged Spyderco round hole. Discussion about unavailability of PE Ladybugs in 2000 in the Spyderco forum. Discussion about Ladybug with gray handles and PE availability (2003 Spyderco forum). Another discussion about colors and PE variations available in Japan (2006 Spyderco forum). See also: LBK, LFG, FL01LFG, LBKII, LSS3, LORP3, LWHS3, LPRP3, LYL3, LBK3HB. All Ladybug variations are made in Seki-City, Japan, and have a Back Lock locking mechanism. The Carbon fibre variation seems to be the most coveted by collectors. Grey PE in USA box would be a contender for the most collectible variation if anyone can confirm it exists. There are open questions marked with '?' above. Any answers? This page was last modified on 3 September 2018, at 18:41.